Kamen Rider OOO the Movie: WONDERFUL, Shogun, and 21 Core Medals RAW! Subs will be posted when available. Author M.F. CalhounPosted on January 18, 2012 Categories MC's postsTags BuraKaWani, debut, full, Kamen Rider Birth, Kamen Rider Fourze, Kamen Rider OOO, Kamen Rider OOO THE MOVIE: WONDERFUL Shogun and 21 Core Medals, OOO Combos, raw, Tokugawa Yoshimune, video3 Comments on Kamen Rider OOO the Movie: WONDERFUL, Shogun, and 21 Core Medals RAW! 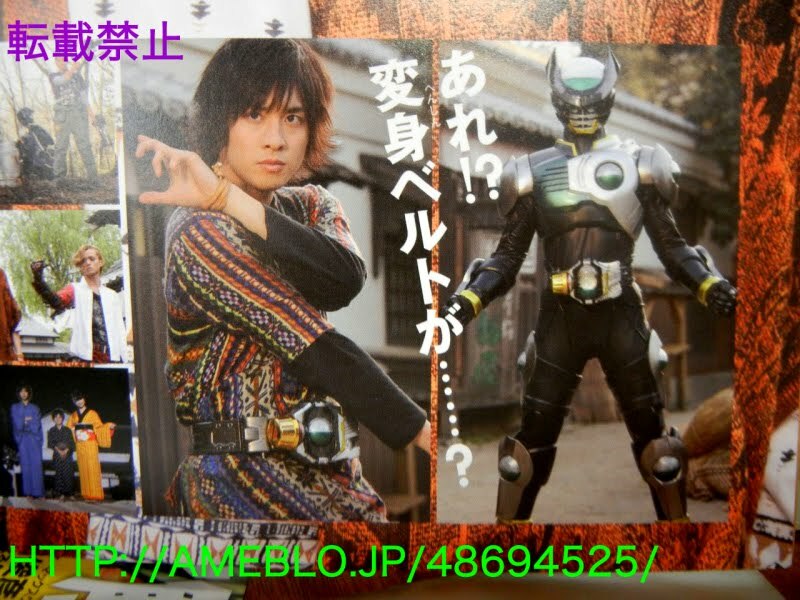 Eiji as Kamen Rider Birth: So who hasn’t been Birth yet? This was taken from the OOO WONDERFUL movie, and as you can see, Eiji temporarily changes into Kamen Rider Birth! In the movie Kamen Rider OOO THE MOVIE: WONDERFUL, Shogun, and 21 Core Medals, Eiji and the other are separated from each other when part of Tokyo is taken back to the Edo Period after Gara took the Core Medals they had, but Eiji was left with the BirthDriver, though I’m not sure why he had it in the first place. Author M.F. CalhounPosted on August 18, 2011 August 18, 2011 Categories MC's postsTags Eiji, Kamen Rider Birth, Kamen Rider OOO, Kamen Rider OOO THE MOVIE: WONDERFUL Shogun and 21 Core Medals, REAL PICS, spoilersLeave a comment on Eiji as Kamen Rider Birth: So who hasn’t been Birth yet? Re:Re:Birth? : Satonaka to henshin into Kamen Rider Birth(!). Before anyone gets too excited, this is not for something happening in the show. This will be something that takes place in the Net Movie Kamen Rider OOO All Stars web-mini-series. Entitled “Net Movie Kamen Rider OOO All Stars: 21 Leading Actors and Core Medals!”, the 21 episodes of the series will be released between July 8th through November 30th, with plans to make a special episode to be released at a later date. Each episode will cost 157 yen per download. Well, what do you think? Should this have been something that happened in the show? Should they have done more to model the costume after her? Any general thoughts on whay you think Date and Gotou are so upset? Let me know in the comments below. Author M.F. CalhounPosted on August 7, 2011 August 7, 2011 Categories MC's postsTags info, Kamen Rider Birth, Kamen Rider OOO, net movie, Net Movie Kamen Rider OOO All Stars: 21 Leading Actors and Core Medals, news, REAL PICS, Satonaka1 Comment on Re:Re:Birth? : Satonaka to henshin into Kamen Rider Birth(!). What do you think? Do you prefer this version, or the “Gotou solo” version? Personally, I prefer this one. The song feels a bit more balanced, more complete. Well, that’s how I feel, what about you? Kamen Rider OOO Info and news: Eiji’s a Greeed, Date returns, and Ankh is finally complete. At the moment, it looks like this transformation, influenced by the five purple core medals in his body, may be permanent. While he can take on a human form, he may not be able to completely revert back into a human. And while both Eiji and Dr. Maki are dinosaur-themed Greeeds, only Maki has been label as the “Dinosaur Greeed”. Eiji is being called the “Eiji Greeed”. And to make matters worse, Ankh has found a way to fully revive! You can see him here, with his face completed, and the place in his “belt” is now yellow. That’s right, Date’s back! And he’ll be fighting alongside Gotou in the Prototype Birth suit, distinguishable by the red markings across the little gashapon capsules. Apparently, the prototype suit only has the Crane arm and the Breast Cannon, although it matches the Birth suit in strength. And it looks like that’s enough to take on a completely revived Gamel. Looks like someone blew the costume budget before they created the prototype Birth…. And I’d like to leave you with this. It’s TaToBa with purple eyes. The effects of the purple core medals have run that far, that deep. Will Eiji ever be able to revert back to human form? Will he be like past Riders, becoming the very monster he fought against, only to fall at the end when all is said and done? Or, will he find a way to undo what has happened? And most important of all, does all of this mean that the series will end on a cliffhanger? Check back soon to find out! Author M.F. CalhounPosted on July 27, 2011 July 27, 2011 Categories MC's postsTags Ankh, Birth Prototype, complete, Date Akira, Dinosaur Greeed, Eiji Greeed, Greeed, info, Kamen Rider Birth, Kamen Rider OOO, newsLeave a comment on Kamen Rider OOO Info and news: Eiji’s a Greeed, Date returns, and Ankh is finally complete. This video is based off of the “Gotou solo” version of the song, which is why it primarily feautures Gotou singing and running around in his new outfit. If a version of this video featuring both of them singin and actively participating shows up, I’ll be sure to post it. The single comes out tomorrow, July 27th, and will be available in either CD or CD+Music Video DVD editions. Author M.F. CalhounPosted on July 26, 2011 Categories MC's postsTags Arisue Mayuko, full, Iwanaga Hiroaki, Kamen Rider Birth, Kamen Rider OOO, Kimijima Asaya, music video, Reverse/Re:BirthLeave a comment on Reverse/Re:Birth PV: Solo Round! OOO TaJaDoru and Birth theme MV preview: It’s music day at henshinhead.wordpress.com! Well, since my last post (which was published five minutes age when I started on this post), I’ve managed to find music video previews for both “Time Judged All”, the TaJaDoru combo theme, and “Reverse/Re:Birth”, Kamen Rider Birth’s theme song. Luckily, they were all uploaded to YouTube by the same guy, kamen000xxx. So let’s see them! Double the Birth, double the fun. Am I right, background dancers wearing the top hats? “Time Judged All” will be released as part of the Kamen Rider OOO Full Combo Collection CD on July 27th, which features full versions of all of the combo songs. “Reverse/Re:Birth” will be released as a single on July 27th as well. Both will be released in CD and CD+DVD versions, with the Combo Collection featuring the full music video for “Time Judged All” and the Birth album featuring the full music video for “Reverse/Re:Birth”. UPDATE: Just realized that I embedded the first video twice. That’s been corrected. Author M.F. CalhounPosted on July 20, 2011 July 21, 2011 Categories MC's postsTags Arisue Mayuko, Iwanaga Hiroaki, Kamen Rider Birth, Kamen Rider OOO, Kamen Rider OOO Full Combo Collection CD, Kimijima Asaya, Miura Ryosuke, music video, preview, Reverse/Re:Birth, Time Judged All, Watanabe ShuLeave a comment on OOO TaJaDoru and Birth theme MV preview: It’s music day at henshinhead.wordpress.com!